But as always, Google thought to add some convenience to your annoyed eyes. Google has re-introduced the CAPTCHA with a full makeover to it. This new CAPTCHA is just a single click in the check-box telling "I'm not a robot". So instead of CAPTCHA or reCAPTCHA, we have now No CAPTCHA reCAPTCHA and this is how it looks. On websites using this new API, a significant number of users will be able to securely and easily verify they’re human without actually having to solve a CAPTCHA. Instead, with just a single click, they’ll confirm they are not a robot. To counter this, last year we developed an Advanced Risk Analysis backend for reCAPTCHA that actively considers a user’s entire engagement with the CAPTCHA—before, during, and after—to determine whether that user is a human. This enables us to rely less on typing distorted text and, in turn, offer a better experience for users. 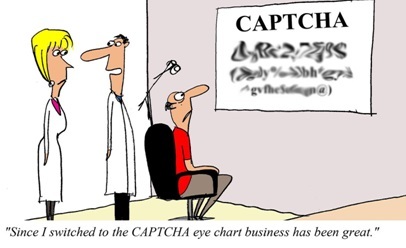 However, Google also made it clear that CAPTCHA will always be present in case if risk analysis engine can't confidently predict whether a user is a human or an abusive agent, in such scenarios it will prompt a CAPTCHA. The No-CAPTCHA is also meant to be more mobile friendly, so instead of having to squint your ayes for some blah-blah text or numbers on your phone’s small screen, you’ll be able to match pictures instead. For example, you may be prompted with a picture of a Lion and be asked to select all the other pictures on the page that show the same animal. Isn't it cool !! Google is helping users to get past security barriers faster and with less frustration and adding a lots of work to do, for the hackers.